Perhaps you have purchased a knitting pattern for one of my handknit pillow designs. 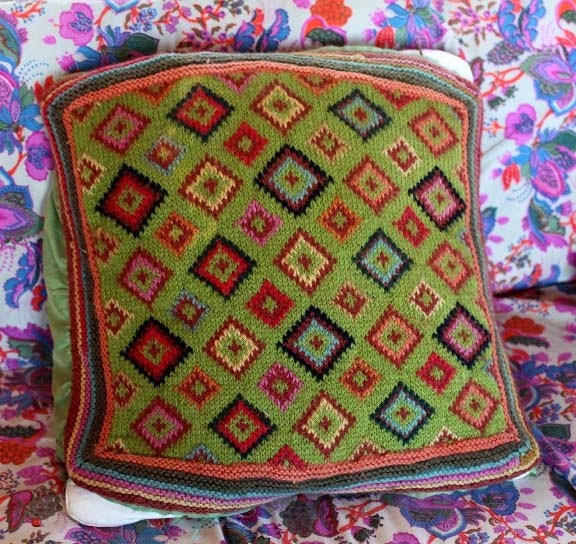 I love knit pillows - they have the feeling of a cozy sweater but by working them in Fair Isle technique and adding embroidery on top of them, they look, to the common eye, like a handmade needlepoint pillow. Only we knitters know the truth. 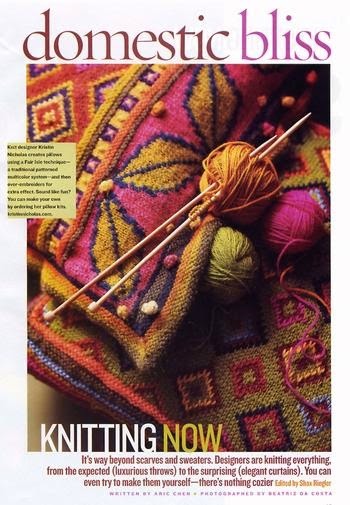 And knitting is so much quicker than needlepoint. I am generally lazy and only want to knit the "front" side of any pillow, I always hand sew a fabric backing to the pillows. I have done one piece fabric backs but they aren't the best choice. Pillows get dirty and need laundering. 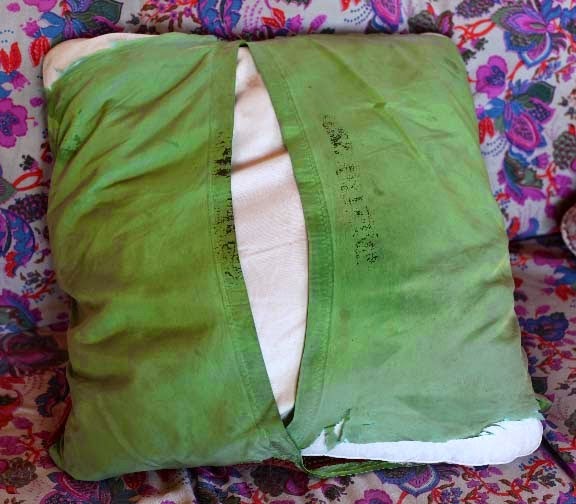 With a one piece back, the inside of the pillow has to be washed at the same time as the pillow case. A better choice and my favorite method of backing a knit pillow is to make a two piece flapped backing of fabric which makes the pillow form inside easy to remove and the pillowcase easy to launder. 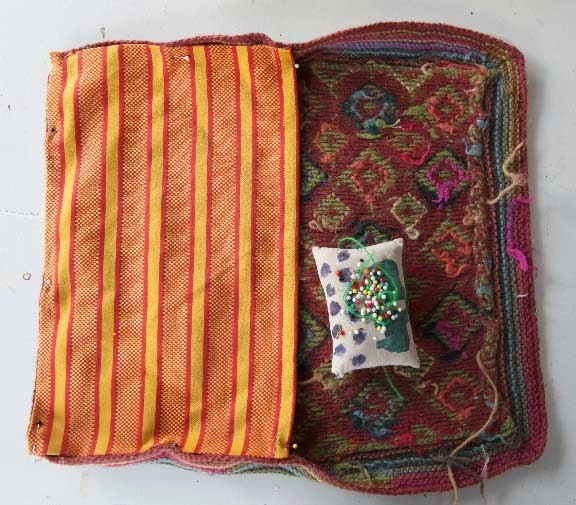 Some of my knit pillows have been around our house for some time. The Field Of Diamonds Pillow was made many years ago and was featured in House and Garden Magazine in 2003 along with the Turkish Leaves Pillow. The photo is below. 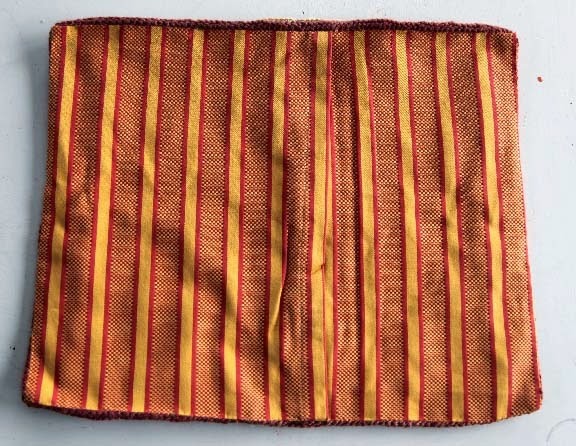 The original pillow backing was silk. This pillow has been exposed to some sunlight and the backing began to shred. Time to sew on a new backing and a chance for a tutorial for the blog. Just so you all know how some projects around here can stretch out into months, I began this tutorial back in October of 2013. A year and a half later, I am finally getting it onto the blog for you all. Once I removed the worn backing, I chose some new backing fabric (not silk, but a durable cotton). Laying the pillow top down on a flat surface, I measured the pillow. 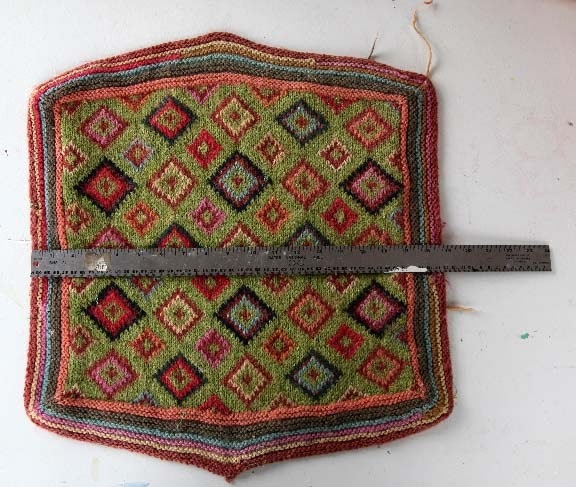 You can see how the knit fabric has stretched over time so I measured the square edges. Take the measurement and add 1" to the length and add 4" to the width of the measurement. Cut the fabric that size. I used a quilting graphed ruler - I love these tools. You can see the lines I drew with a Sharpie. Cut out the rectangle of fabric. 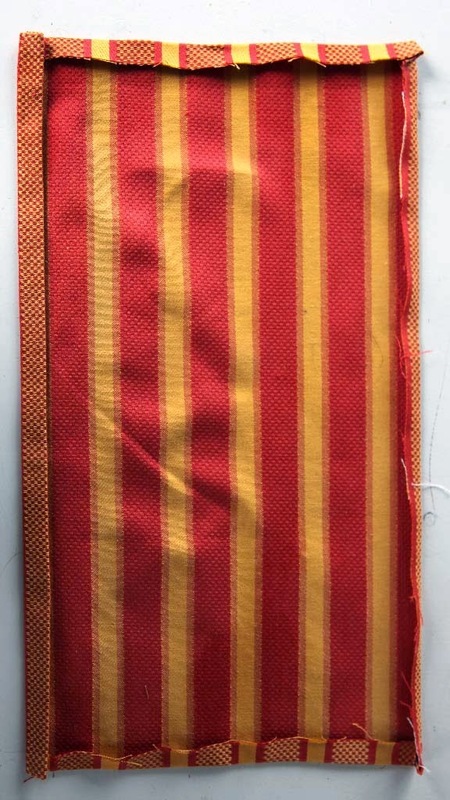 Fold the fabric in half with the shorter sides together. Cut the fabric in half. Referring to the photo, press the 2 short sides and 1 long side under 1/2". At the remaining longer side of the piece, turn the edge under 1/4" and then 1/2" again. Repeat for the second piece. Here is a close-up of the twice turned under edge. This will form the overlapping flap for the removable backing. 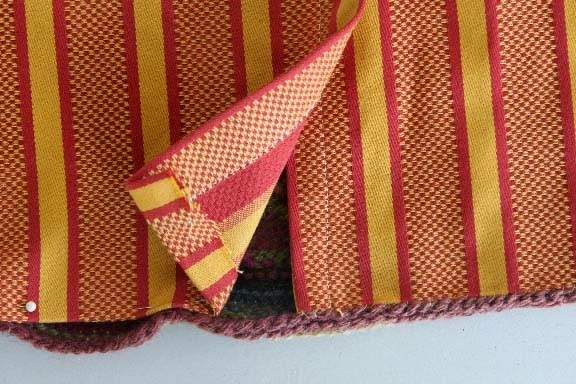 Using a sewing machine or by hand, stitch down the twice folded edge. 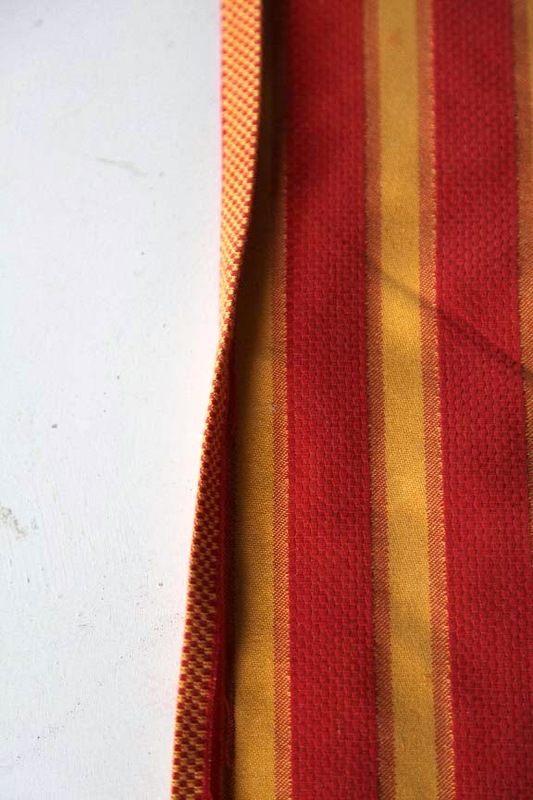 This is what the two pieces will look like when hemmed. They are ready to be attached to the knit pillow front. 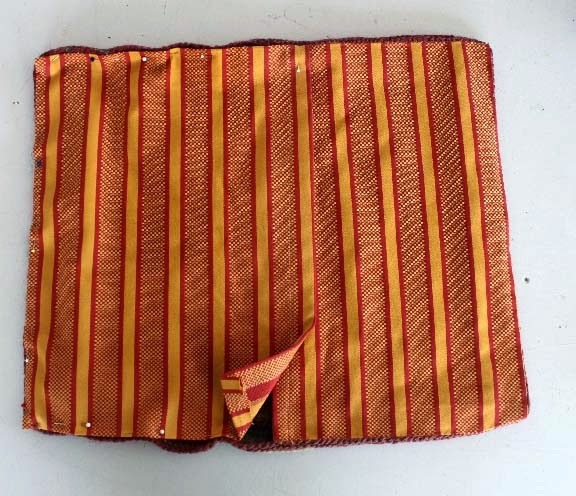 Using straight pins, attach one of the pieces of hemmed fabric onto the pillow with wrong sides together. The double hemmed edge should be at the center of the pillow. 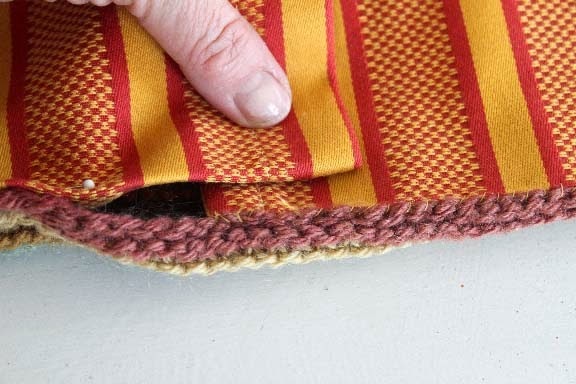 With a needle and sewing thread, use small whipstitches to attach the fabric backing to the bound off edge of the knit pillow. 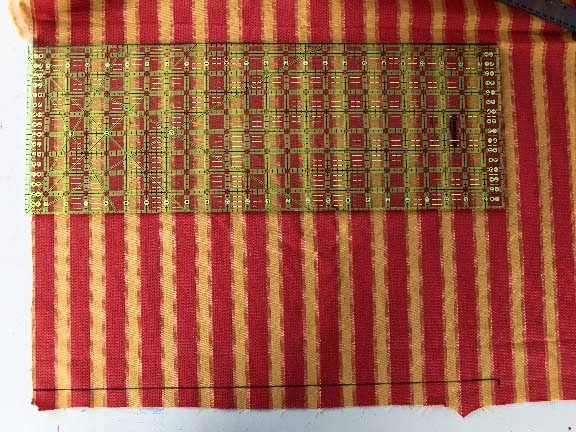 When you are finished, using pins, attach the second backing piece to the pillow, overlapping the hemmed edges at the center. 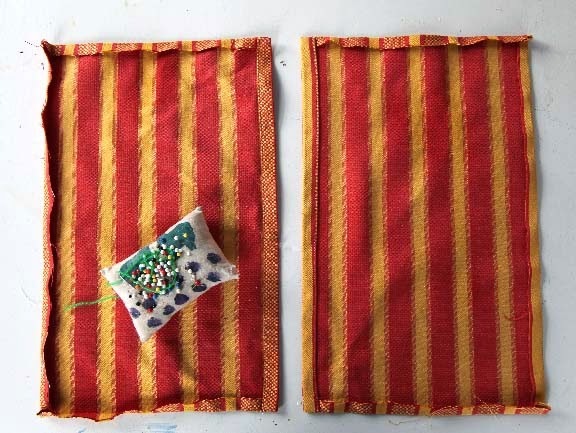 Using small whipstitches, sew the second piece of fabric to the knit pillow. 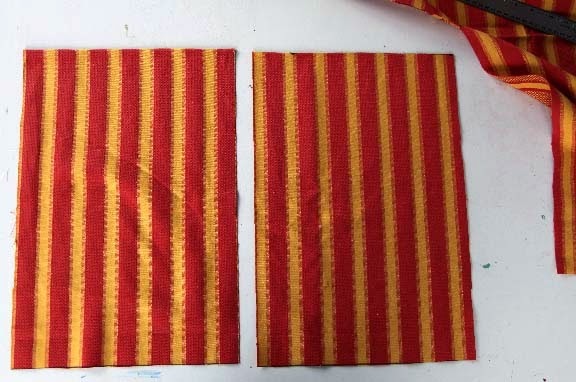 Here is the pillow with both pieces attached before pressing. Good as new. Quick to do and the pillow case can be removed quickly and laundered. Thanks, Kristin, for reading my mind :) I'd covered some pillows with tapestry a few years ago and it's time to renew them but I'd been putting it off because I forgot exactly how I'd done it. This has nothing to do with your pillow tutorial (which is very clearly stated), but I wanted to let you know how you make me smile every time I open your blog page. Your cover photo at the top of the page with its beautiful bright colors and your "contented" kitty just make my day, so thank you! Thanks for this. It's given me the idea to knit a 2 piece back so I don't have to deal with a zipper or sewing fabric to a knit piece. I find it just as easy to sew in a zipper before you put the back on. It's right there in a nice flat surface - if you don't plan on displaying the back the zipper can just as well be in the middle or to one side or the other. No need to try to get it into an edge. I have pillows for Christmas, and I can take out the pillow form to use in another pillow after Christmas. The holiday cover goes to be washed before it's stored.